The Tipi Raiser's launched the Race to Winterize in October to address the storm damaged homes from a severe summer 2018 storm. The Race ran through mid-December, employed an average of 20 Lakota tribal members and engaged over 80 volunteers visiting from out-of-state. This project couldn't have happened without the collaboration of Wakpamni and Oglala Districts, the Pine Ridge Retreat Center, Our Lady of the Sioux in Oglala, the OST Office of Emergency Management, the Tribal Vice President's Office and Running Strong. With these partnerships and the support from our donors and volunteers we replaced windows and siding, repaired and replaced roofs, installed insulation, repaired walls, trailer skirting and floors and provided firewood. Overall, assistance was provided to nearly 80 homes in the combined districts of Oglala, Wakpamni and Pine Ridge! But by the end of the Race it was clear that we had just scratched the surface - with nearly 500 homes damaged in the storm. So the race goes on- and those same Lakota workers are continuing on through extreme cold, snow and wind. The Tipi Raisers has partnered with the Housing Authority to execute on a federal Imminent Threat grant with a goal to get to as many of those homes as possible by May. Click the button below if you would like to donate to the ongoing efforts to employ local Lakota workers in repairing homes in their community. 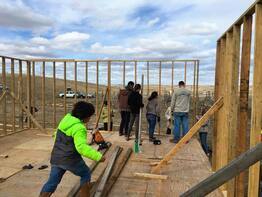 On October 15th the Tipi Raisers launched a 24/7 WORK EXCHANGE program on Pine Ridge to continue construction of the Belt family home and assist Pine Ridge families in repairing their homes and preparing for winter. In July of 2018 a devastating hailstorm and tornado tore through Pine Ridge leaving a trail of destruction behind it. FEMA declined to provide the much needed assistance and tribal officials have directly asked The Tipi Raisers and our corp of volunteers to help in whatever ways we can. We established the Work Exchange program to work on as many of those homes as we are able to as well as to cut and distribute badly needed firewood and continue to construct the Belt family home. The "Race to Winterize Pine Ridge Homes" fundraising campaign was established and enabled us to keep the Work Exchange running through our goal of December 15th. Moving forward our focus will shift from the Race to Winterize to the Race to Repair Storm Damaged Homes in this impoverished community. Throughout the winter we will be continuing our push to provide assistance to the many homes still in need of help- as well as firewood and space-heaters. Even the smallest DONATION can make a world of difference! If you wish to continue working toward the completion of the Belt Family home please see the registration form below or contact: info@thetipiraisers.org.